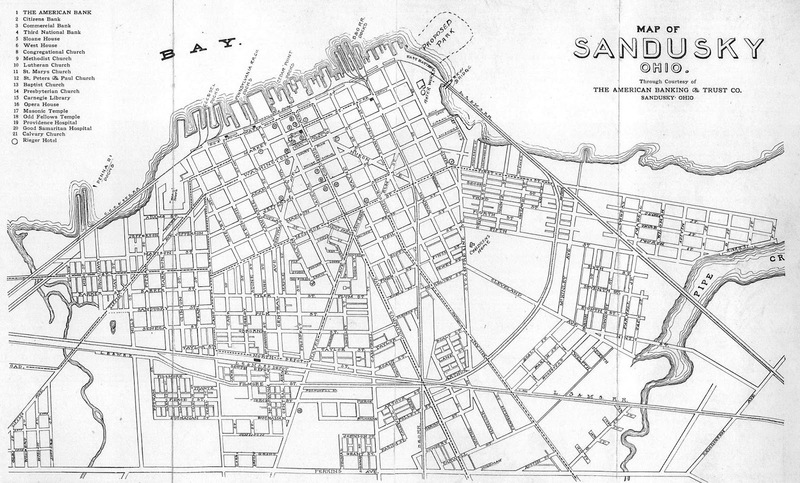 This map of Sandusky was printed about 1915, through the courtesy of the American Banking and Trust Company in Sandusky, Ohio. An ad attached to the map was sponsored by F.A. Purdy, who was the manager of the Sandusky Buick Company at that time. The words “Proposed Park” appear at the site of what we now know as Battery Park. An article in the June 16, 1914 issue of the Sandusky Register reported that two thousands loads of dirt had recently been taken over to the proposed park area as fill. Plans were in place for shade trees to be planted in 1915. 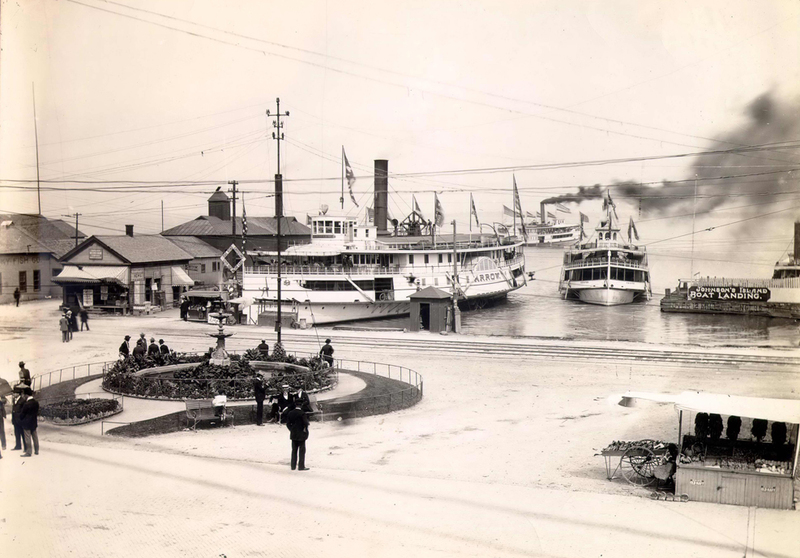 Sandusky City Service Director J.J. Molter stated that Battery Park would one day be a “beauty spot” of the city. 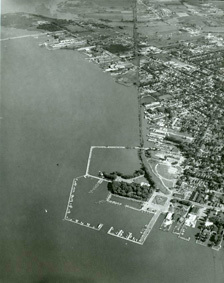 This 1956 aerial view of Battery Park shows the layout of the park along Sandusky Bay. 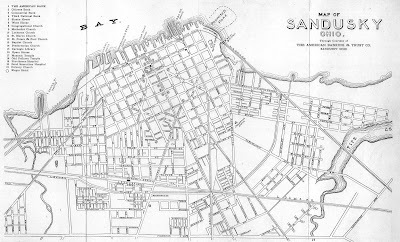 In the 1915 map, there were docks along the waterfront for the Cleveland, Cincinnati, Chicago and St. Louis Railway, the Pennsylvania Railroad, Cedar Point, and the B and O Railroad. The old water works was still standing on Meigs Street, approximately where Sandusky’s municipal building is now. The areas between Fifth Street and Cleveland Rd., as well as between Cleveland Road and Milan Road were relatively undeveloped at this time. 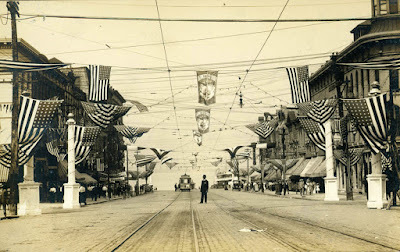 This postcard from the Perry Centennial in 1913 provides us with a festive view of Columbus Avenue in Sandusky a couple years before the map was printed. This picture was taken in the adult section of the Sandusky Library in 1973. It appeared on page 33 of a booklet produced for the Sandusky Area Chamber of Commerce. At the bottom of the picture above, you can see the 3 x 5 inch file cards which were still used then for patron records and circulation of books and magazines. Of course now all those records have been computerized. 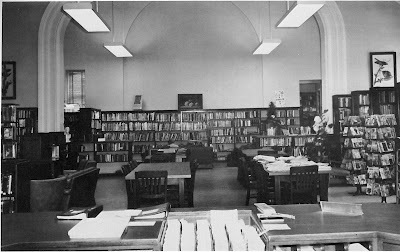 Fiction books lined the shelves along the back wall. Carousels containing paperback books were located adjacent to the study tables. The director’s office was then up the stairs in the back corner of this room. This room is now part of the Children’s Services area of the Sandusky Library. 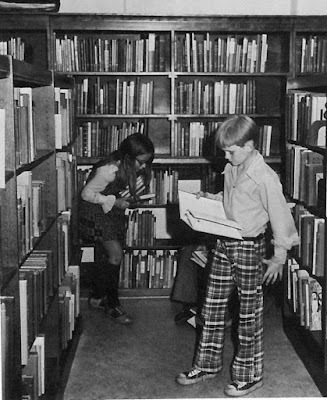 Below, two youngsters are browsing in the children’s non-fiction books. Their clothing definitely is from the 1970s. The room where the young people are browsing for books is now a part of the Baby Garden in the Children’s Services section of the Sandusky Library. 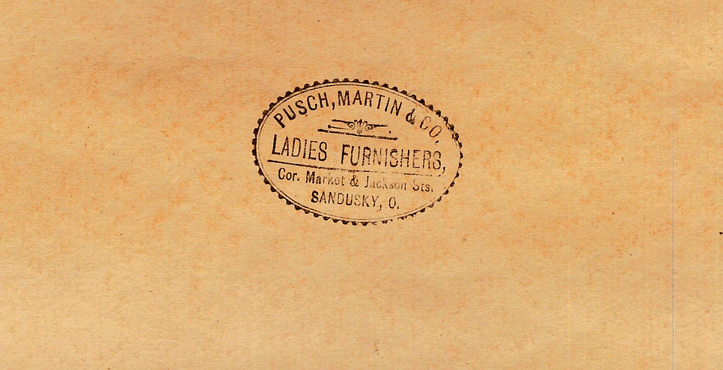 Promotional items which were once given away to customers of the Pusch, Martin and Company in downtown Sandusky were donated by the Steinert family to the Follett House Museum. 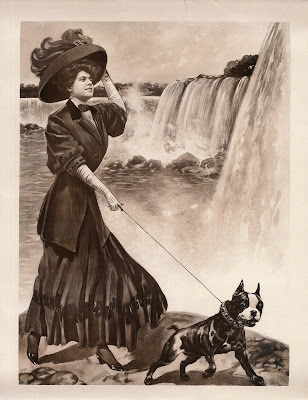 Pictured above is a print that shows a smartly dressed young woman walking her dog near Niagara Falls. 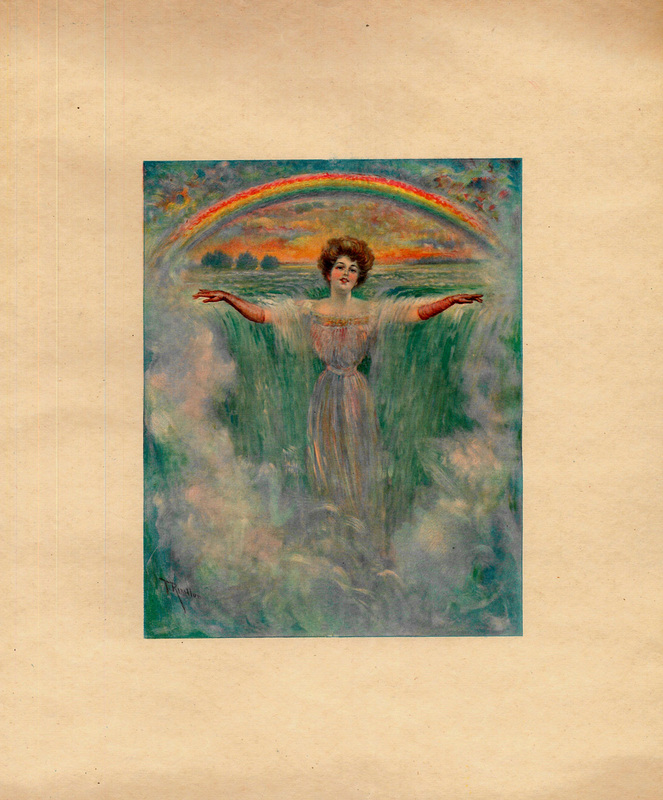 Another print features a lovely lady who appears to be emerging from a waterfall, with a rainbow overhead. The company’s stamp appears on the back of each item. 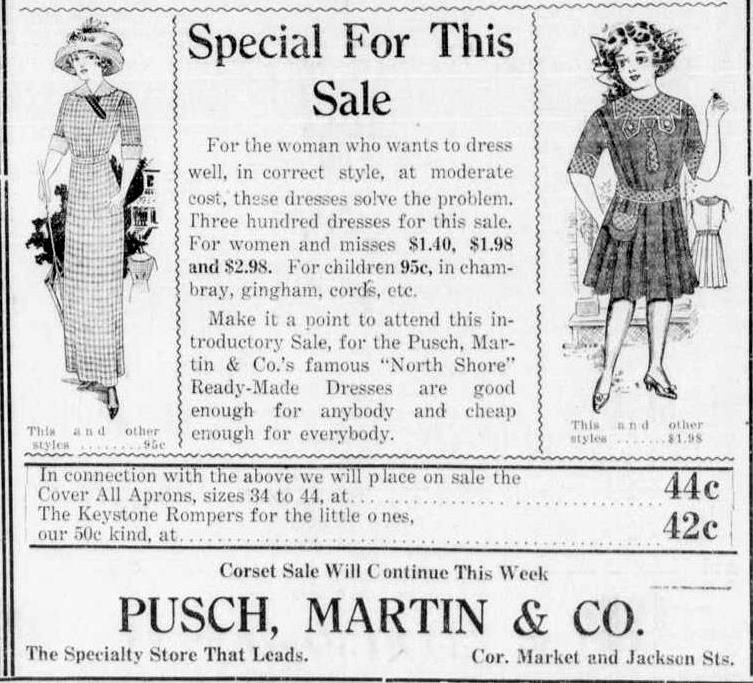 The Pusch, Martin and Company store was at the northeast corner of West Market and Jackson Streets from about 1910 to 1913. In the 1920s, E.B. Ackley had his billiard parlor at this location. Edwin D. Martin and Edward W. Pusch were the proprietors of the store, which sold ready to wear clothing for women. 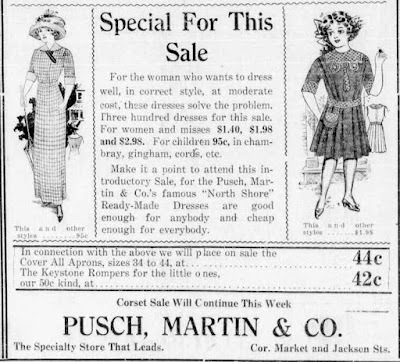 This 1913 advertisement from Pusch, Martin and Company, states that the “North Shore” ready-made dresses sold there were “good enough for anybody and cheap enough for everybody.” Dresses for women ranged in price from $1.40 to $2.98. Children’s dresses sold for ninety-five cents. Aprons and rompers cost less than a dollar each. 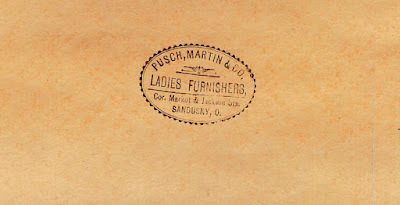 The partnership between Mr. Pusch and Mr. Martin was dissolved in August of 1913. Soon after, Edward W. Pusch opened a dry goods store in the 600 block on Hancock Street. Edwin Martin went on to work as a salesman for the Globe Paper Company. 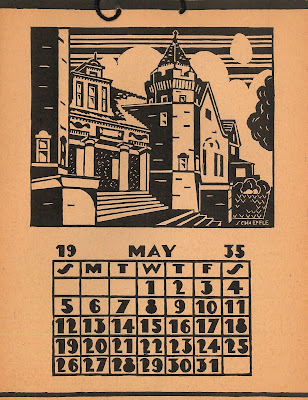 In 1934 the students of Sandusky High School’s Senior High art class created illustrations for a 1935 calendar. Miss Marian Yocum, head of Sandusky’s Art Department, taught the senior high school art class. Illustrations created for each of the twelve months featured a print that had been engraved by students onto linoleum blocks. 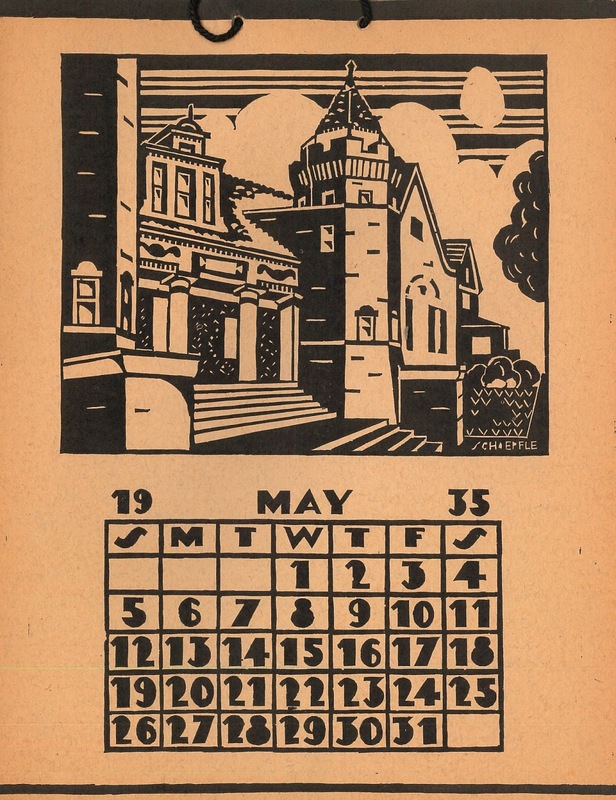 John Schoepfle illustrated the calendar page for May, 1935, which featured the Sandusky Library. John Schoepfle, a 1934 graduate of Sandusky High School, was the son of Sandusky physician Dr. H. C. Schoepfle. John went on to study at the Cleveland Art Institute and later taught adult education classes in Los Angeles, California. In the 1970s, he and his wife Nadine moved from California to Kennebunk, Maine, where they owned and operated the Harbor House Gallery. The Gallery featured art work by both John and Nadine Schoepfle. Mr. Schoepfle died on January 4, 2011, at the age of 94. An article in the November 24, 1934 issue of the Sandusky Star Journal lists the names of the student artists, and describes the prints for each of the twelve months, as well as the cover illustration. 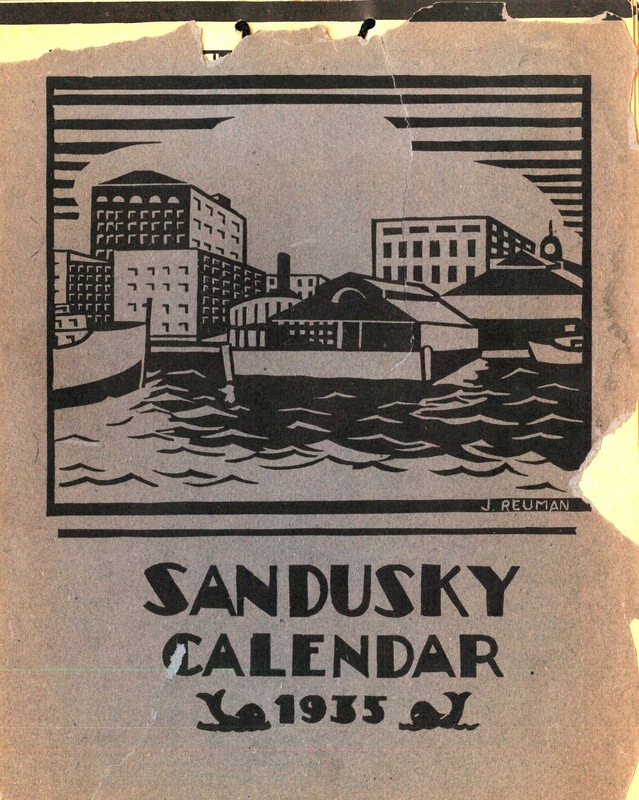 The article went on to suggest that the 1935 Calendar would be ideal for gift giving during of the holiday season. 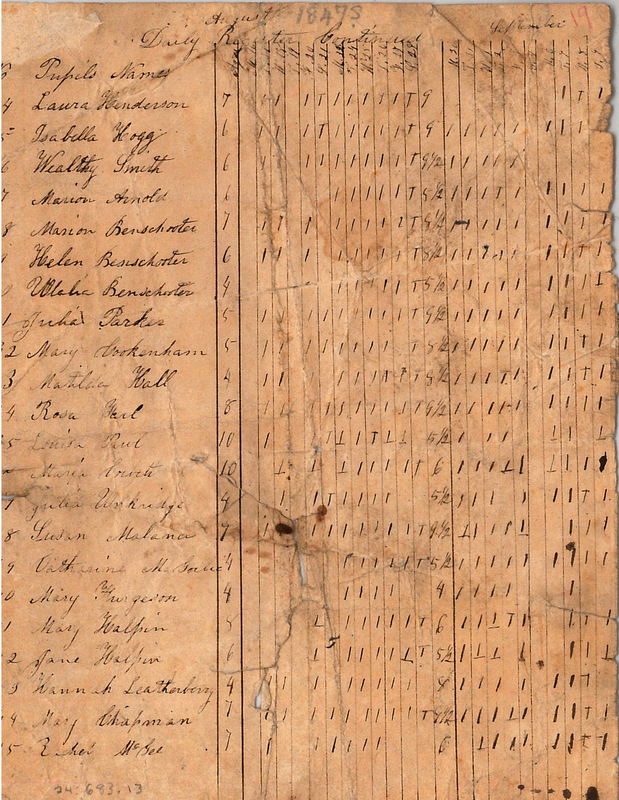 In April, 1822, David Campbell issued the first copy of the Sandusky Clarion, a predecessor of the Sandusky Register. The paper was renamed the Daily Register after Earl Bill and Clark Waggoner took over as editors of the paper in 1851. 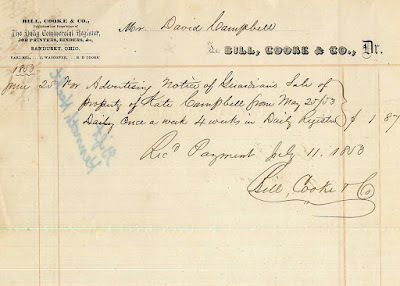 Eventually Henry D. Cooke became associated with the business. 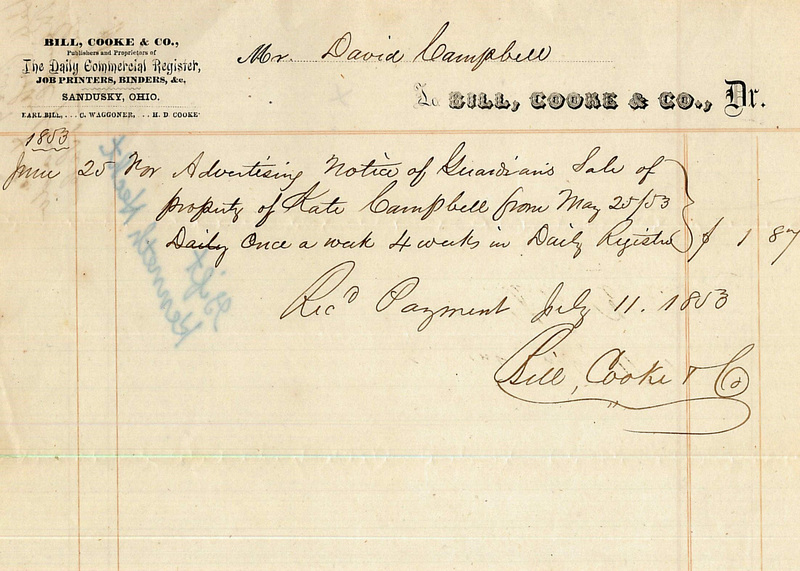 The newspaper firm was owned by Bill, Cooke and Company when this receipt was issued to David Campbell in 1853. Hewson Peeke wrote in A Standard History of Erie County, Ohio (Lewis Publishing Co., 1916) that the Register changed hands three or four times between 1855 and 1869. 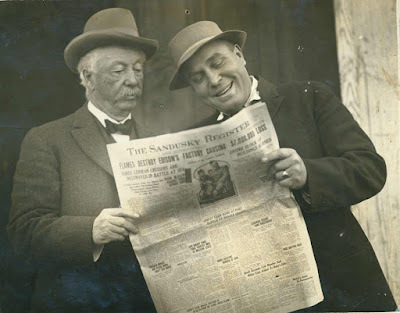 It was after Isaac Foster Mack became half-owner in the newspaper in 1869 that the local newspaper in Sandusky became known as the Sandusky Register. 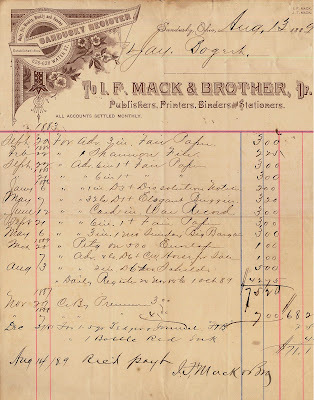 In this 1872 receipt, signed by I.F. 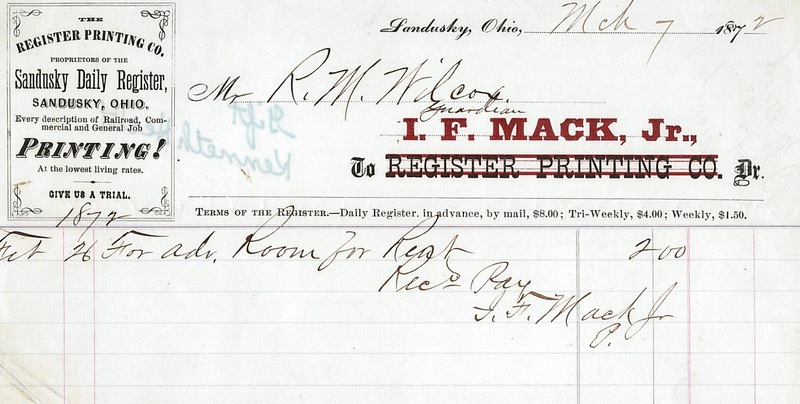 Mack, the paper was known as the Sandusky Daily Register, under the proprietorship of the Register Printing Company. According to the letterhead on this receipt from August 3, 1889, at that time the Sandusky Register had a daily, tri-weekly, weekly, and Sunday edition. I.F. Mack and Brother were the publishers of the Sandusky Register in 1889. 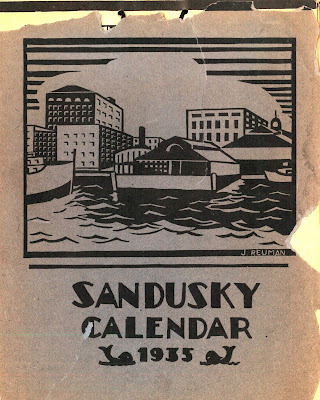 Though the names changed slightly throughout the years, the Sandusky Register has a long history with the residents of Sandusky and Erie County. Visit the Sandusky Library Archives Research Center to view historical copies of Sandusky newspapers on microfilm. There was you will also find an interesting biography of I.F. 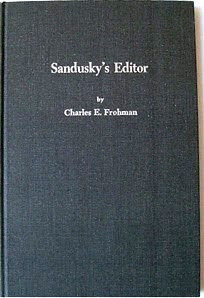 Mack by Charles E. Frohman, entitled Sandusky's Editor. 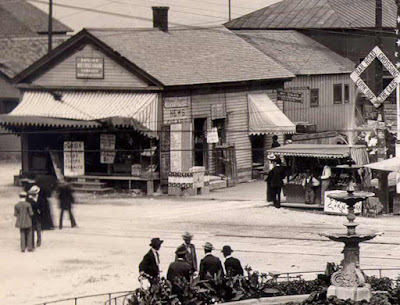 In the late nineteenth century, the foot of Columbus Avenue looked quite different from Sandusky’s waterfront today. People could board trains as well as steamships here. 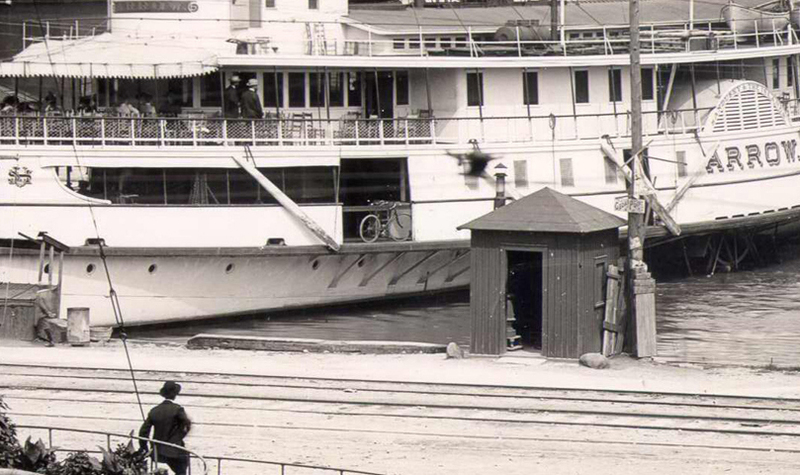 The interurban also had tracks that brought people to these docks. 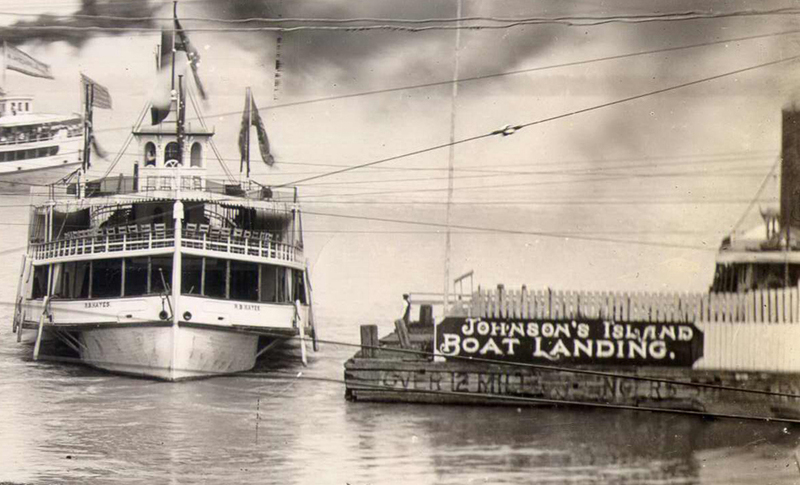 From downtown Sandusky, visitors could travel to Cedar Point, the Lake Erie Islands, and even to Detroit. The business at the left side of the picture below shows a stand that sold cigars and newspapers. A popcorn stand was located beside the news stand. A diamond shaped railroad crossing sign warned people to look out for railway cars. A group of men were deep in conversation in front of the fountain. In this close-up view of the Arrow, you can see two men walking on the deck. A bicycle is visible on the lower level, suggesting that a passenger planned to take a bicycle ride once they got to their destination in the Lake Erie Islands area. 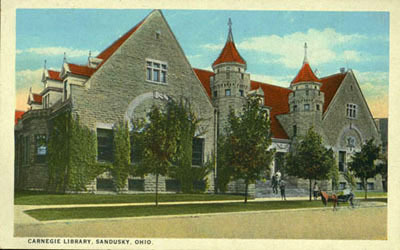 Visit the Sandusky Library Archives Research Center to view hundreds of historical photographs from Sandusky and Erie County. You can also access historical photos online at the Past Perfect Local History Archives. 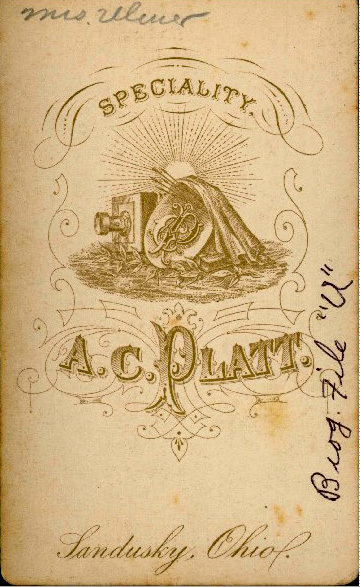 A carte-de-visite labelled only as “Mr. Ulmer” is in the biographical section of historical photographs at the Sandusky Library Archives Center. There is also a portrait of Mrs. Ulmer. Both of the cartes-de-visite were created at the studio of Sandusky photographer A.C. Platt, who died in Sandusky in 1884. 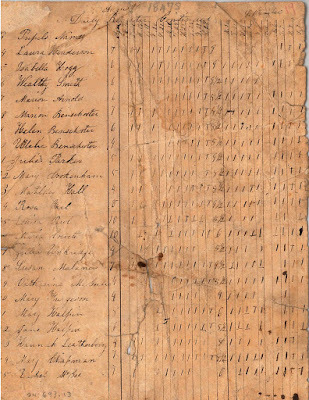 By looking at the 1880 U.S. Census for Erie County, Ohio, there are two logical choices for helping in the indentification these individuals. 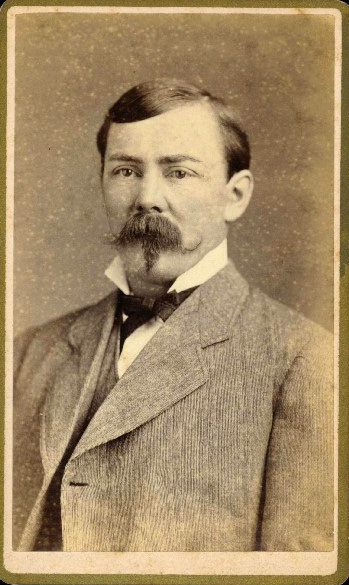 In 1880, Albert Ulmer, age 38, was listed as a dairyman. 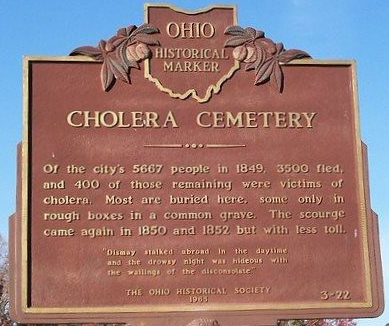 He resided in Perkins Township with his wife Louise, and their four daughters. 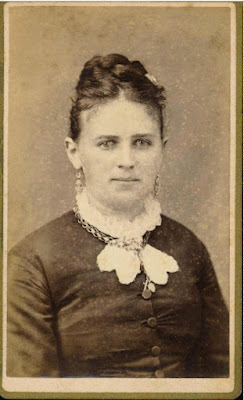 Jacob Ulmer a wagonmaker, age 39, lived in Sandusky, Ohio with his wife Susan, and brother Florian. Albert and Jacob Ulmer both stated that they had been born in Germany.